Hey y’all! WOW I am so sorry that I ended up taking a week-long hiatus from the blog! I took an amazing trip to Cali (eek I can’t wait to share!!) and all the prep + travel meant that the blog needed a bit of a break. But I’m so so so excited to be “back in action” today! 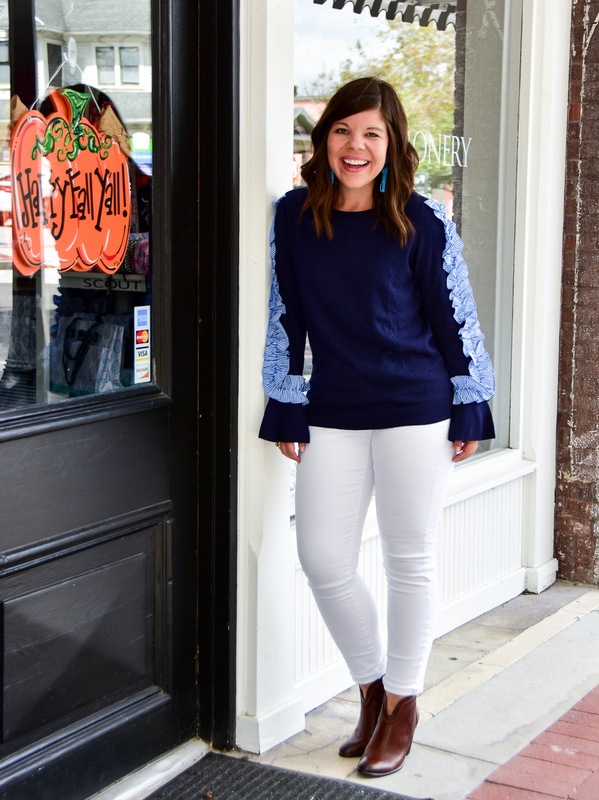 That’s why I’m loving that so many sweaters this season are what I consider “statement sweaters.” From ruffles, to bows, To cold shoulders (and somethings all three!) 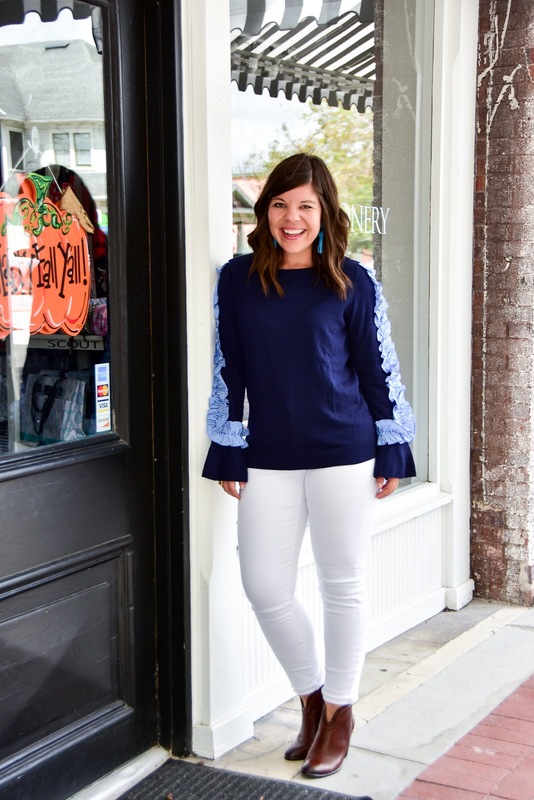 I’m loving the personality and pizzaz that is on the clothing shelves this season! 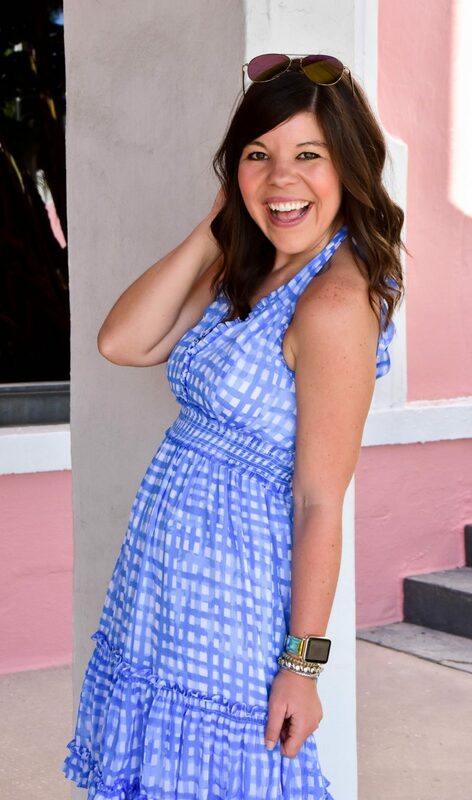 When I saw the striped ruffle on today’s look I was instantly smitten y’all! 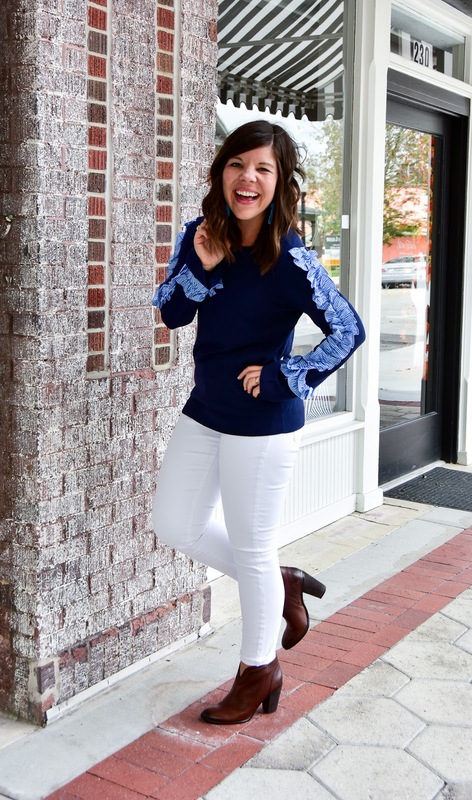 Just that little detail takes this look from an everyday navy staple, to something unique and head- turning! 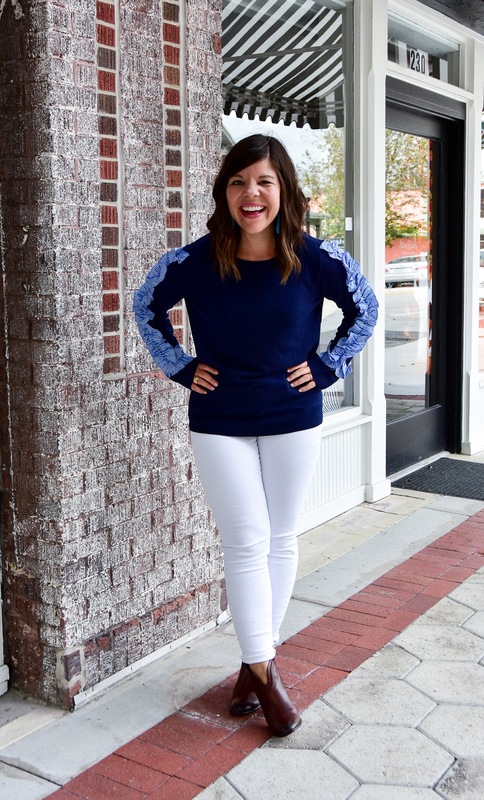 White jeans are the perfect base layer to let this look pop! What a cute sweater! 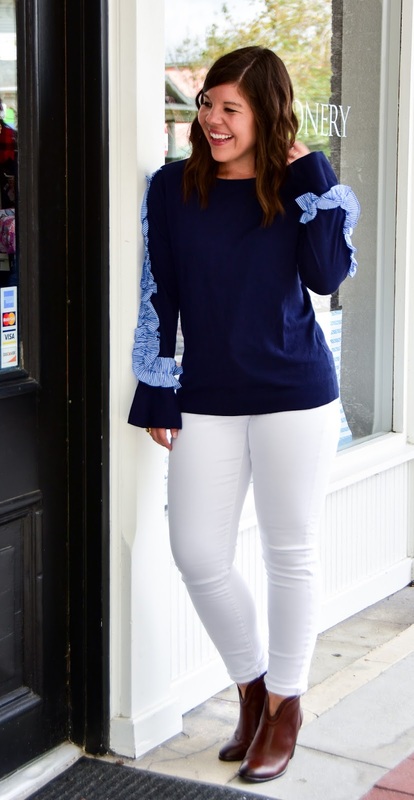 I love the ruching detail on the sleeve! This top is SO darling! I love ruffles as well and some of your suggestions are so cute. 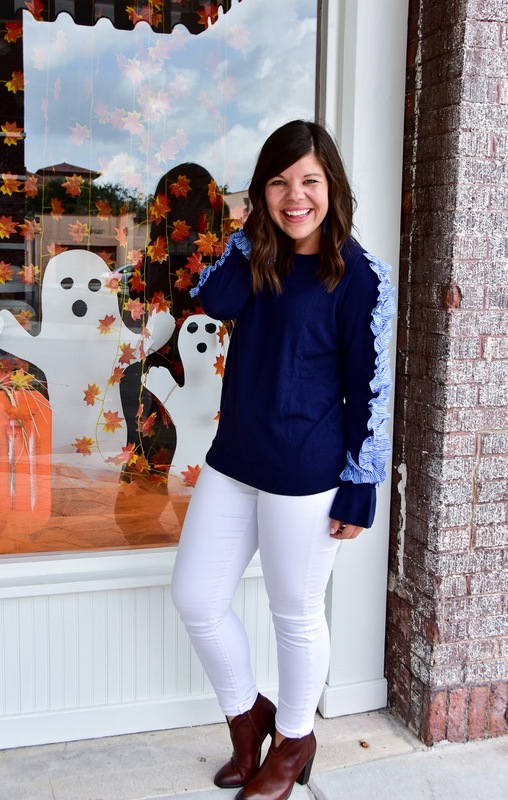 I need that bow sweater! 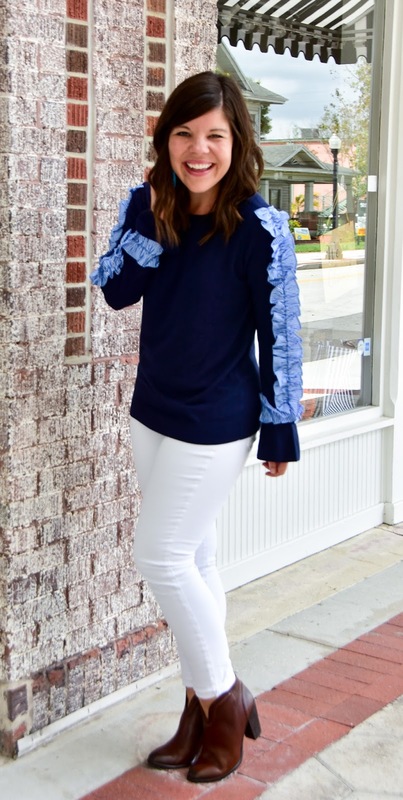 I love the idea of a statement sweater!! Give me all the ruffles and big bows. You linked to so many good ones, too. Those stripes are fantastic! You make fall in Florida look great! Such a cute look! I love all of those sweaters! The stripped and gray ones are super cute! Such a cute sneaker you got there dear! I love the details on sleeves. Also, fab booties!